While professionally made pond filters can cost hundreds of dollars, it is possible to make pond filters at home for much less. Just as effective at filtering out pond waste and building beneficial bacteria colonies, homemade pond filters require only a few simple materials and an hour or two of your time. Rinse the plastic container--either a plastic tub or snap-lid large bucket--with clear water inside and out. 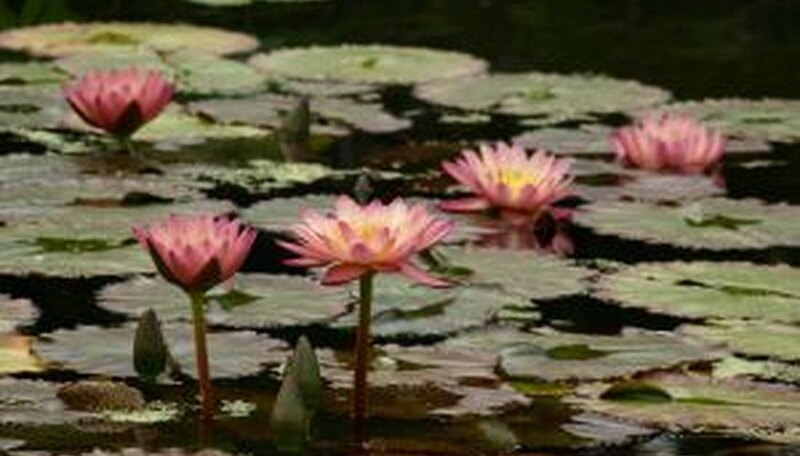 The size of the container will depend on the size of the pond or water garden you intend to use it for. Also, rinse any PVC pipes, screen, filter media or batting and rocks. The rocks ideally should be rough shaped and no more that two inches in size. Do not use any soaps or cleaning solutions. Using a sharp utility knife, cut a hole approximately two inches up from the bottom of the plastic pond filter container. The hole must be the appropriate size to admit the PVC pipe you intend to use. Also, cut a large open space in the center of the lid of the plastic container. This will be where the water flows into the pond filter. Cut a short length of PVC pipe, and fit it into the hole near the bottom of the plastic pond filter container. Use silicone or a similar sealant to attach it and to stop any leaks around the pipe. This pipe is where the pond pump will be attached to draw the water down through the filter. Attach any hoses or tubes to this PVC pipe through various connectors, which are available at hardware or garden pond stores. Use the utility knife or a pair of scissors to cut a piece of sturdy window screen large enough to cover the entire opening of the plastic filter container. If desired, attach it to the lid of the container with sealant. Be sure not to use glues or sealants that are toxic to fish and plant life. Or, if you prefer, leave the screen loose. Pour the rinsed rocks into the bottom of the plastic container at least one-third of the way up. There should be spaces between the rocks, so the water can flow smoothly through. These rocks will provide a home for beneficial bacteria to grow and transform ammonia in the pond to less harmful chemicals. Fill at least another third of the plastic container with the purchased filter mat, a white or black material that is like hard fleece, or thick quilt batting. This material should be porous to allow maximum water flow, while trapping particulates that float about in the pond water. It must be loose in the filter, so it can be removed easily and rinsed out regularly. Lay the unattached screen over the top and put on the lid so the screen is taut. Sink the homemade pond filter into your pond at a deep point as soon as the appropriate hoses and pumps are attached. Wait several minutes for it to fill with water. When the bubbling stops, turn on your pond pump, and the water will draw down through the screen at the top, be filtered as it passes through and come out the pump end clean.